Sorting out the differences between buzzards and vultures is like following a soap opera. There's a variety of bloodlines and families to consider, as well as where the birds live. There are Old World vultures and New World vultures, and buzzards' place in the order depends on where home is. Before understanding the differences between buzzards and vultures, you must know which birds you’re comparing. In the United States, when someone refers to a buzzard, it means a turkey vulture, a member of the New World vultures. Elsewhere in the world, a buzzard is in the same family as Old World vultures – Accipitridae – in the Buteo genus. In North America, the Buteo genus refers to hawks or buzzard hawks. 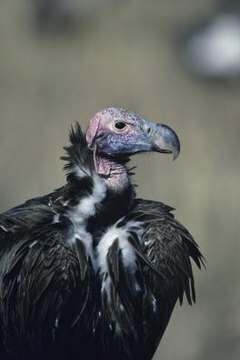 Until 1994, conventional wisdom was a vulture is a vulture; all vultures were considered members of the order Falconiformes. After discovering American vultures are closely related to storks and ibises, vultures were classed into Old World and New World categories. Old World vultures, found in Europe, Africa and Asia, are part of the Accipitridae family of birds. New World vultures are in the Cathartidae family. Like their stork relatives, New World vultures have very weak feet, which is fine for them since they don’t use them to grasp prey. They have a keen sense of smell. If you’re thinking about a turkey buzzard, he’ll have the same weak feet, since he’s really a vulture. Being more similar to eagles and hawks, buzzard hawks and Old World vultures have strong feet to grasp prey and a weak sense of smell. The turkey buzzard and six other species New World vultures live in North, Central and South America in a variety of habitats, ranging from high mountains to deserts and lowland forests. Old World vultures live in Africa, the drier parts of Asia and warmer parts of Europe. You're likely to find them in mountainous or open areas, though not in forests or places with high rainfall. Buzzard hawks are found through much of Europe, living in mountainous areas, quiet rocky coasts and sea cliffs, and farmland and forests with large clearings. Vultures everywhere are known for eating carrion, otherwise known as dead animals. The only vulture preferring a different diet is an Old World vulture, the palm nut vulture -- officially known as Gyphohierax angolensis -- who eats oil palm fruit instead. Buzzard hawks are birds of prey, eating small animals, insects and carrion. The turkey vulture is unique among all vultures and buzzards in his ability to regurgitate his last meal on command. This is more than a party trick; if threatened he uses this ploy to surprise and disgust his predator with the foul odor.